Water is not my element and I panic very quickly when I am in deep waters. 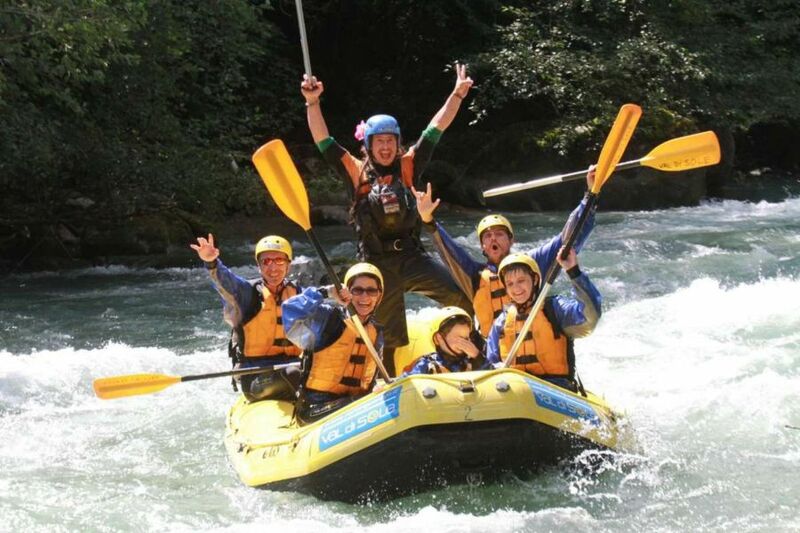 So when I saw white-water rafting mentioned in our itinerary, my first reaction was not of excitement. I checked discreetly with the staff at the rafting centre about how safe it was and I found myself marginally reassured when they said that there was absolutely nothing to worry about. I also saw several older people changing into wet suits and that went further in calming my nerves (what me, ageist?). But honestly, I need not have worried at all. After some basic instructions, our rafting guide Alessandro gently eased the raft into the deceptively calm Noce river. What followed was almost an hour of navigating through jagged rocks, rowing past roaring eddies and whirls on a raging river that simply swept away everything in its path. At one point, we were all asked to get down from the raft onto the shore and then asked to walk to a shallow part of the river, lie flat on our backs and let the river carry us further. And when one of the guides blew his whistle, we had to turn over and swim to the shore. My feeble protestations were ignored and we were told that it was a safety exercise that everyone had to do in case we fell off the raft. Again, I needn't have worried as once the initial shock of the cold water had worn off the water was much less fearsome and as soon as I heard the shrill whistle, I quickly swam to the shore (my family of course has a far less flattering version of this story). One that involves me doing an ugly shriek and flapping about in blind panic. You decide which version you'd rather believe. Every now and then Alessandro would point to a beautiful castle or a bird and I would momentarily remember to look up at the sights that had unfolded in front of me. White-water rafting was the singular most thrilling ride I'd had up until then. But that was to be eclipsed soon when I climbed into a canoe a couple of days later. In part 3, the Arumbakkam family take on a glacial lake in canoes. Until then, check out our wide selection of multi-activity holidays across Europe suiting all ages, abilities and interests.